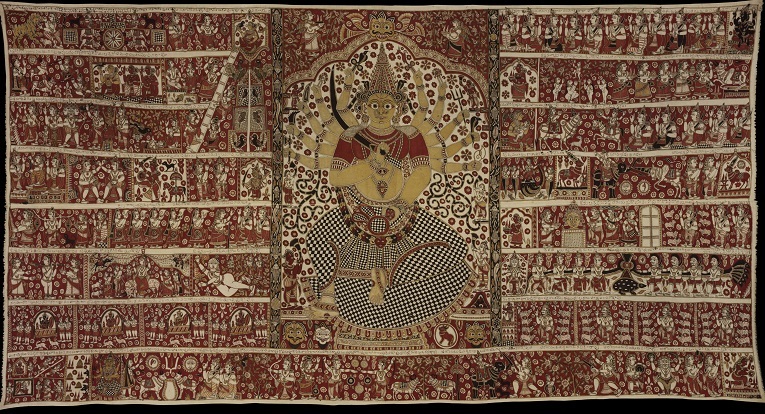 A number of the textiles in the Fabric of India exhibition were made to be used in architectural contexts, whether as furnishings for buildings or as a type of portable architecture in themselves. As we didn’t have space in the exhibition to discuss these relationships, this blog aims to provide some additional context for those pieces. When we visit historic buildings in India today, they are usually empty shells which give no idea of how they could function as liveable spaces. The missing element is textiles, whether in the form of lavish furnishings and patterned clothing, or basic practical additions like awnings on the building’s exterior. Textiles can transform not just the appearance of a building but also its function. 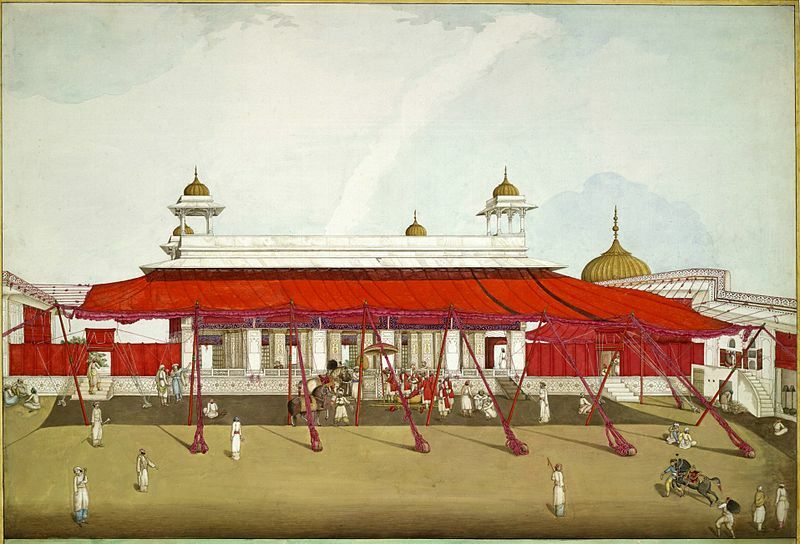 The awning added to the front of the building in the Red Fort in Delhi (shown above) provides shade for the building itself and the public space in front of it, and the cloth screens on either side both limit public access to these royal pavilions and also join them together into a usable suite of buildings – unlike the isolated monuments they appear as today. 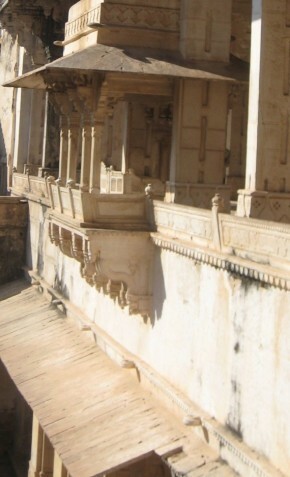 The attachment of awnings (shamiana) to buildings was essential in India’s climate and the integral rings built into the walls of palaces, like these in Bundi (above), show that they were incorporated into the buildings at the time of their construction. The rings are visible in the photograph above the lower eave. Maharana Sangram Singh II of Mewar receiving Maharaja Sawai Jai Singh of Jaipur in camp. Mewar, ca.1732. © National Gallery of Victoria, Melbourne. 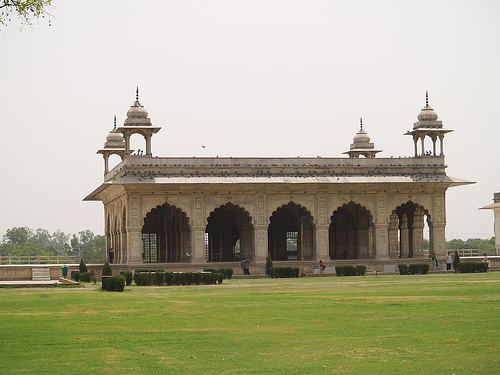 While the provision of shade and comfort were the prime functions of awnings and carpets, cloth screens functioning as moveable walls provided an important element of privacy, as well as shelter from north India’s chilly winds. These are called qanat (a Turkish word originally meaning ‘wing’) or parda, the Persian word for curtain, familiar to us today in the anglicised form of ‘purdah’ meaning female seclusion behind such a screen. Screens or cloth walls are also used to limit access to the ruler: in this painting (above), he sits at the centre of concentric layers of cloth. 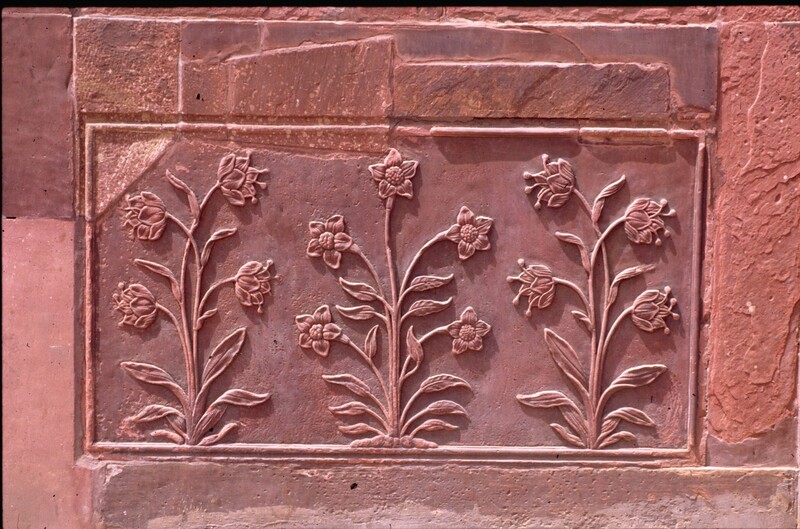 These are decorated on the inside with floral motifs which are found on both built and cloth architecture. 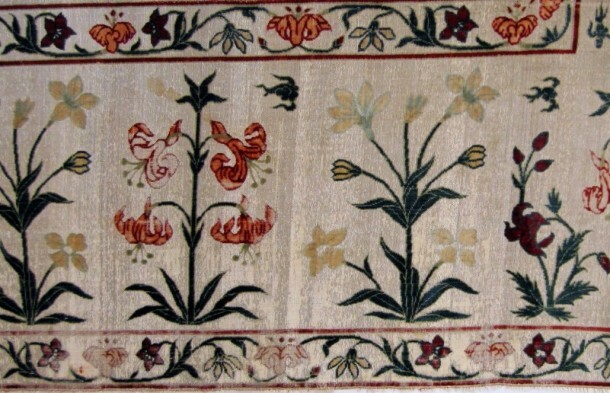 Flowers were used extensively on Mughal and Rajput buildings of the 17th century, and these patterns were echoed in the textiles that furnished them. The use of floral decoration reflected the Mughal emperors’ love of nature, but also embodied the idea of paradise as a garden: to be surrounded by flowers in a palace or mosque was to have a premonition of paradise. Textile patterns painted on cloth attached to the ceilings of Himalayan monasteries such as Tabo (or sometimes on the ceiling plaster itself) replicate the designs of large canopies that were suspended below the ceiling, like the silk piece with Buddhist lotus design shown below. 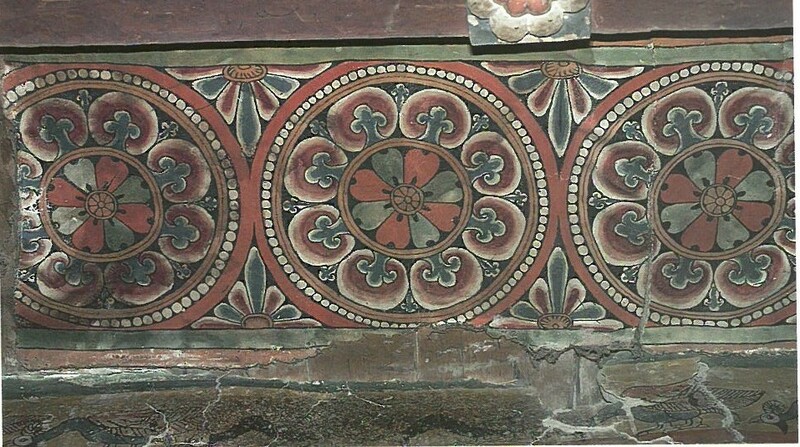 Tabo, Himachal Pradesh, assembly hall ceiling, ca.11th century. © C. Luczanits. Part of a silk canopy with lotus design, ca.16th century. © Khalili Collection of Islamic Art. Narrative scenes painted on to temple walls also often echo textile forms. 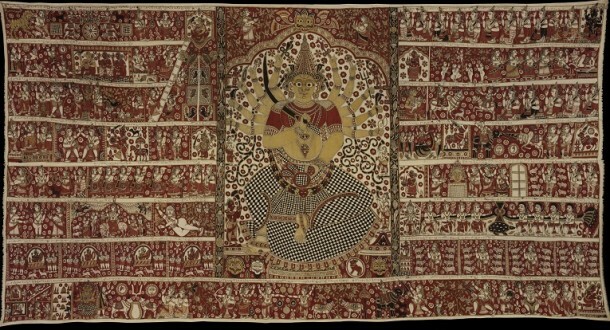 Horizontal registers showing scenes from epics like the Ramayana or stories of local heroes (often themselves deified) occur on both paintings and textiles, like the one below. Temple hanging of the goddess Gangamma. Machilipatnam, dated 1881-2. © Victoria and Albert Museum IS 1759-1883. Cloth can also function as architecture in its own right, as for example in the case of tents. 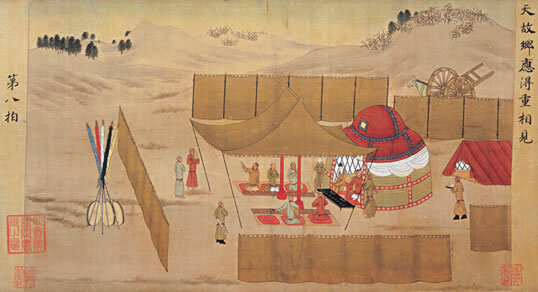 This 15th-century Chinese painting illustrates the story of a Mongol ruler who had abducted a Chinese princess, and this is his Central Asian encampment. 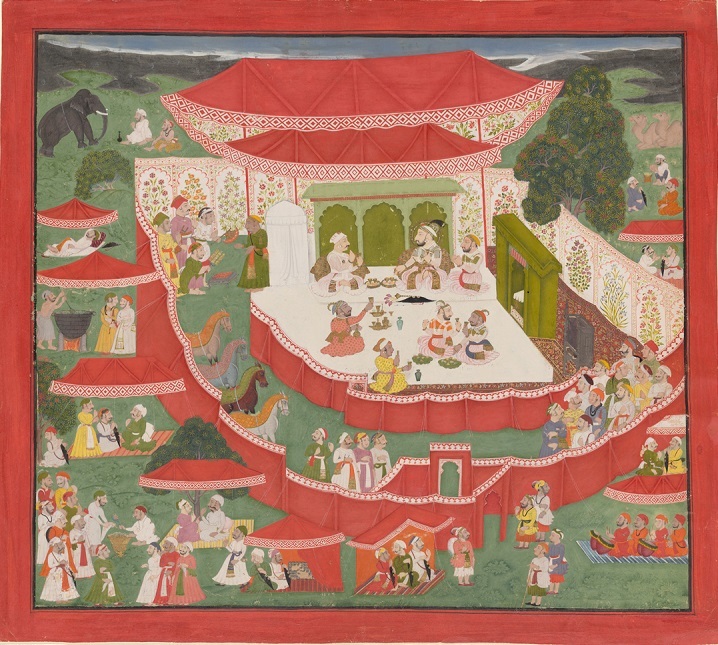 It shows the same ensemble of a private tent, awnings and cloth screens that we see later in Indian images of tented enclosures. A Mongol encampment. China, early 15th century. © Metropolitan Museum of Art, New York. The Mughal painting below shows how the emperor Jahangir combined the double or even triple-layered canopy associated with Mughal kingship with two round tents of completely Central Asian type. It’s not clear whether these two side tents performed any function other than as purely symbolic visual links to the Mughals’ Mongol ancestors. 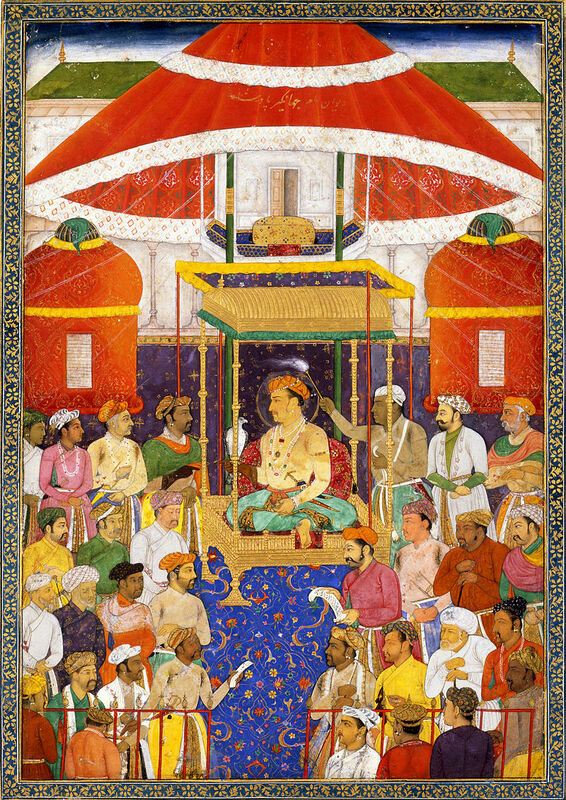 The Emperor Jahangir in darbar. Mughal, ca.1620. © David Collection, Copenhagen. 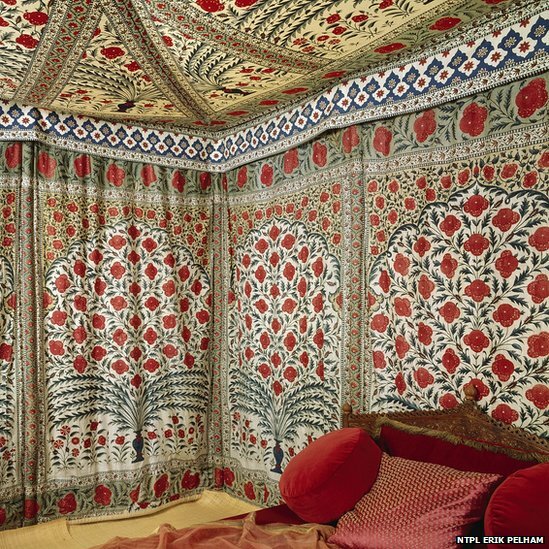 In India, the tent became conflated with the ancient concept of the royal sunshade (chhatri) or canopy, and very often what we call a tent is more accurately a canopy combined with a cloth wall, as is the case with the splendid royal tent that belonged to Tipu Sultan of Mysore. Free-standing temples and shrines can also be constructed from cloth. These create a temporary enclosure for worship of a local goddess, hung with textiles depicting the goddess and related deities. 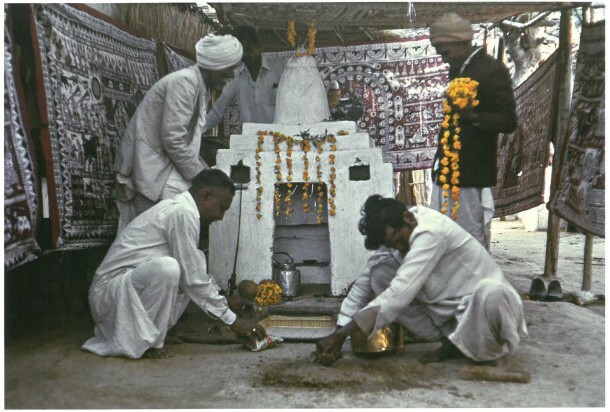 In the case of the Vaghri community of Ahmedabad, the reason for the outdoor, temporary shrine is that the devotees are from Dalit communities (once called Untouchables or Harijan) who were formerly prohibited from entering mainstream Hindu temples. Textiles can provide exclusive spaces for both Dalits and kings, and can perform all the social functions that built architecture can, as well as some of the physical ones. The overlap between built and textile architecture is underlined by shared decorative imagery which blurs the boundaries between them, and practicality and beauty can combine to transform a bare stone building into a shaded floral garden. Architecture cannot function as a living space without textiles, while cloth has the capacity to create buildings on its own. As a blogger, your main concern is to share your ideas top your target audience. To get to that point, you will need to learn how to build a blog, something that this resource can help you do. Once you have built your blog, you will need gain blog visitors for your message to be heard. For this, you will need to learn SEO to optimize your blog so search engines can index your pages. An aspect of SEO that deals with usability and user experience is site architecture. Observing the best practices of site architecture will make your blog load faster, which impacts your bottom line. Below are basic site architecture tips to help get your site up to speed. A quick way to pop the hood of your website is by running it using the W3C validator and checking for validation output errors. If you’re not a programmer, you will need help professional help to resolve the detected problems. A recent development in markup languages used to display website content is HTML5. Following the tutorials featured in this post should give you a better understanding on how this markup language can help develop an efficient website or blog. For a quick overview of HTML5 and the tags you can use, refer to the cheat sheet here. A sitemap makes it easier for search engine spiders to crawl your site. This site tells them all your pages so they won’t have to browse through each from your site. This way, your pages will be indexed much faster. To create a sitemap, use a sitemap generator tool to automatically create the sitemap for your website. Download the file and upload it on Google Webmaster Tool. If you have a WordPress blog, download any of these plugins to generate the file from your dashboard. This term is introduced by internet marketer Bruce Clay. 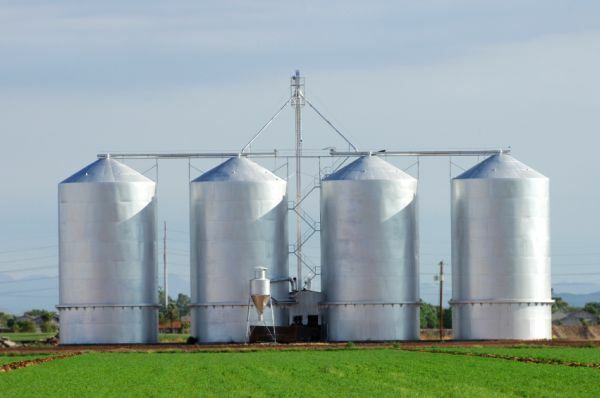 Taking the concept of silos, website siloing refers to the grouping site pages together that cover the same subject theme. To learn how to implement this process to your website, read the exhaustive guide here. For an much simpler and version of the guide, begin with this post in a series by Michael Gray. He effectively breaks down the fundamental concepts of siloing in different posts. WordPress blogs possess an inherent advantage with siloing. New posts can be “siloed” by creating categories. Downloading plugins like the WordPress SEO by Yoast even gives you access to features like breadcrumbs, permalink structures, and others that help with your site architecture. One of the biggest issues in creating your blog that people take for granted is the web hosting. If anything, your choice of web hosting plays an important part on how your blog will perform and be received by your target audience. A poor hosting can cause slow loading time, lots of downtime, and compromised security. As a result, this could impact your visitors. Even if you have created a website using an unsatisfactory web hosting, it’s not too late to migrate your data from there to an even better hosting service. This post should give you a better idea on what to look for in a web hosting. Once you have chosen a better web hosting, this post will teach you how to migrate your WordPress blog from your unreliable hosting to a more stable one. If you have a blog that receives thousands – if not millions – of traffic daily, you must consider dedicated and managed WordPress hosting. This is a high-performance hosting service that ensures fast loading of your blog. It appoints a support team that will take care off all of the issues on your back end. This way, you can focus on developing your site without worrying about site downtime. The post Site Architecture Tips to Make Your Blog Load Faster appeared first on SpyreStudios.